Online ordering menu for Richie's Restaurant and Sports Lounge. 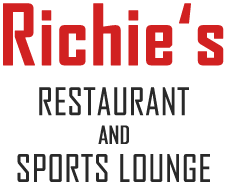 Richie's Restaurant and Sports Lounge in Schiller Park, Illinois is the place to be for delicious American cuisine. Our large menu has everything from soup and pizza to sandwiches, and wraps. We also serve pasta, steaks, and seafood dishes! Find us just a block from the O'Hare International Airport on Lawrence Avenue. We're not far from Rosemont Theatre and Schiller Woods South. Order online for carryout or delivery!